Protestors start to gather in front of the Riverside County Court House to listen to speakers of the event. 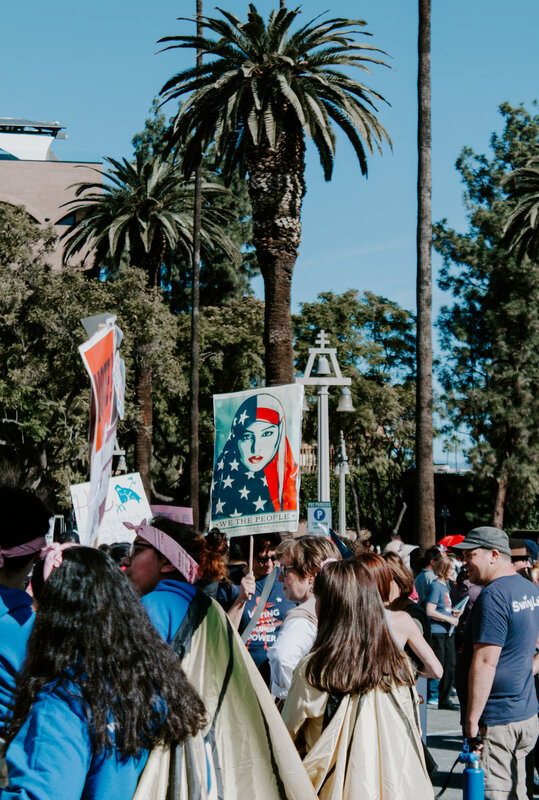 Roughly 4,000 individuals attended the Women's March in Riverside on Jan. 19, 2019. Photo by Nadine Hale Hautea. 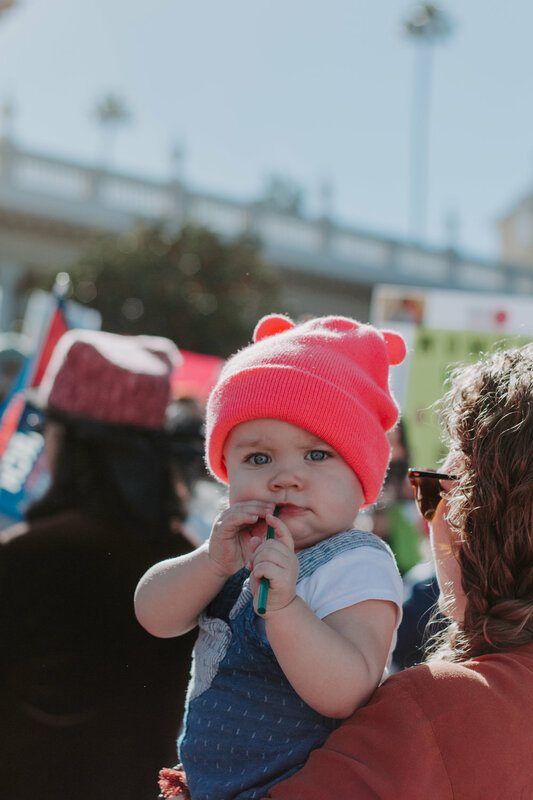 On Jan. 19, residents of Riverside and the surrounding cities attended the third annual Women’s March at the Historic Riverside Courthouse. Women and men arrived in droves as they urged each other to be the resistance. There were about 4,000 people in attendance listening to a dozen speakers, according to Kat Schuster of The Press-Enterprise. 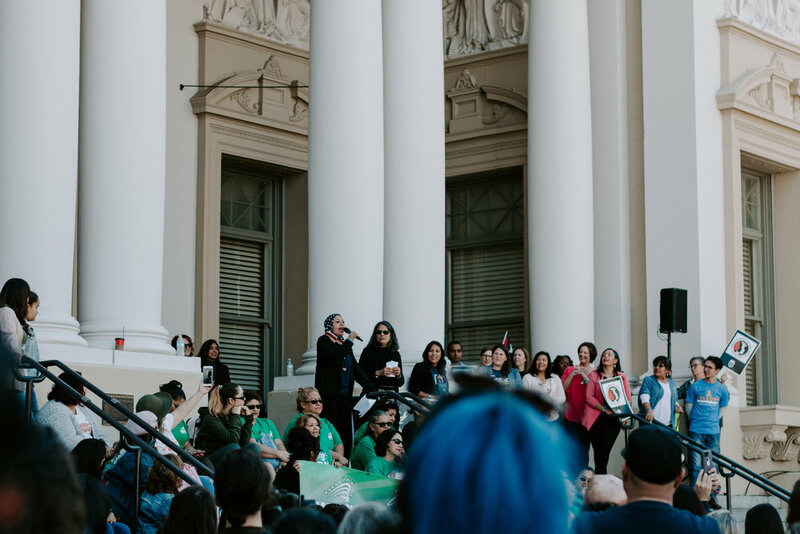 Comedian Laura Hernandez, Riverside Rabbi Suzanne Singer, Assemblywoman Eloise Reyes, and Assemblyman James Ramos were among the speakers rallying those in attendance of the march. The crowd began to gather around the historic courthouse before the event started. At 10 a.m., the crowd shifted its attention to the speakers and representatives in attendance. 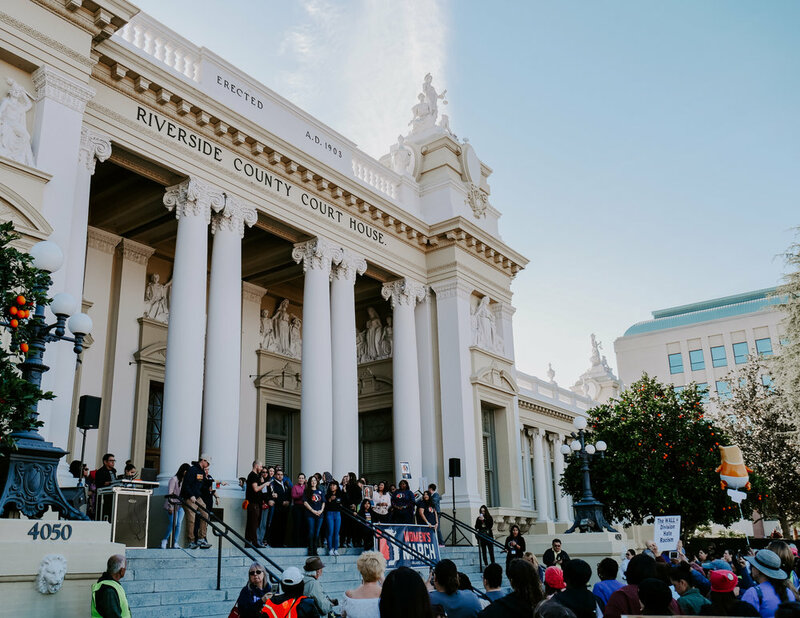 The Riverside Revival Resistance Chorus performed multiple songs on the steps while the crowd rallied them on. 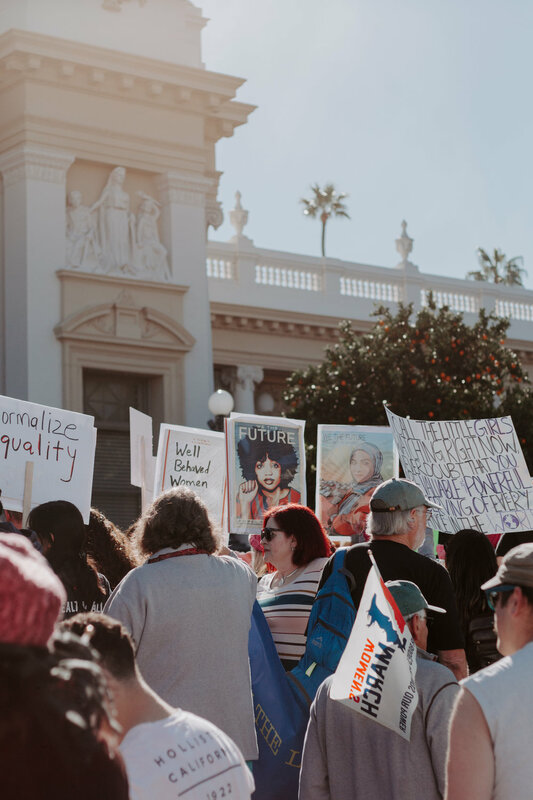 Women and men hold their posters and chant while marching down the streets of Riverside, California. The march started at 11 a.m., after spokespeople rallied up attendees. Photo by Tommy Stiles. 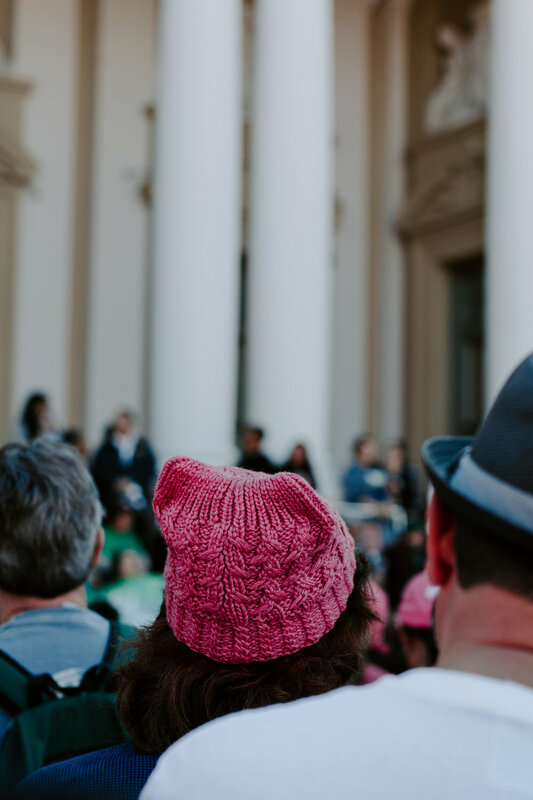 Jurupa Unified School District Trustee Karen Bradford shared it was her second time attending the Women’s March in Riverside. She held a sign with a photo of her taking oath at Jurupa Unified School District board and the words “I was elected to make a difference” written above the photo. During the first hour, attendees chanted "End the shutdown now" and vocalized their support for the third annual march. Women and men of all ethnic and religious backgrounds gathered at the Riverside courthouse with signs including "Vivan las Mujeres! ", "Careers have no gender" and "Feminism is another word for equality," along with shirts to protest the disenfranchisement of women. Attendees of the march brought homemade signs declaring what they are fighting for. Signs were also sold from tables surrounding the court house. Photo by Raylene Camerano. Local resident Brianna G. admitted this was her first ever Women's March. "I want to be out here, I want to stand with other women and just be a part of something that matters. Sometimes when you think you have a voice, it can be lonely because you don't think anyone is listening but when you come into situations like this you know everyone is listening to you," Brianna stated. Brianna's insight was common throughout Saturday's march. The speakers echoed the significance of unity and perseverance throughout the community. Cheering rumbled through the crowd as countless women shared stories of tenacity in the workplace, at home and out in public. Stand-up comedian Laura Hernandez was one of the final speakers of the event. "I want you to know that your presence here also represents the voices of the women who are not able to be here," Hernandez said. "We give voice to our sisters who are missing and murdered indigenous women and trans women. Women who are held in detention facilities and incarcerated and institutionalized. Women with physical disabilities, learning disabilities, and who are currently in hospitals. Their voices are represented here."